All items are created in Xero with their item codes, descriptions and purchase and sales details. Note that Inventory accounts are set up in MYOB as ‘other assets’ and as Xero does not have an ‘other assets’ account the inventory accounts generally convert as a ‘fixed asset’. Xero will not allow you to change the ‘fixed asset’ to an ‘inventory asset’ account so there is some manual work to implement tracking post conversion (refer Converting untracked inventory to tracked in Xero below). If you select a transactional history service you receive postings for sales and purchases, sales value and purchase value. Note that the item name/description will be converted into the inventory Sales Description in Xero, regardless of whether the item is bought or sold. Please note that active and archived Inventory will be converted. Item codes come across on approved Invoices and bills. You will NOT receive item codes on credit notes, draft invoices or bills. We cannot convert files is the Negative Inventory setting is enabled. Please refer to our knowledgebase article on how to deal with this. During the conversion process Inventory Items are converted as ‘Un-tracked Items’ this allows the items to be connected to the COGS account and the Sales account. In MYOB you have the ability to mark/tick an item as ‘I inventory this Item’ which allows allocation to the COG account, Sales account and the Inventory account. Xero have recently updated how you can handle inventory in Xero and this new functionality now allows clients to track and use the relevant inventory accounts. However, our conversion service does not allow inventory tracking to be converted to Xero. 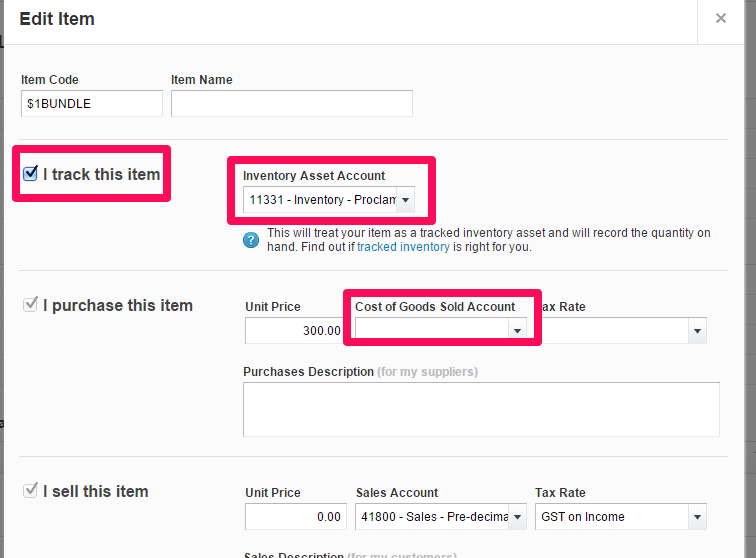 During the process of creating your ‘tracked’ items in Xero you will be able to allocate the relevant inventory code. Please see screen shot of the information that needs updating in Xero.